Seventy years ago today—on October 14, 1947—Charles Elwood Yeager became the first person to travel faster than the speed of sound. 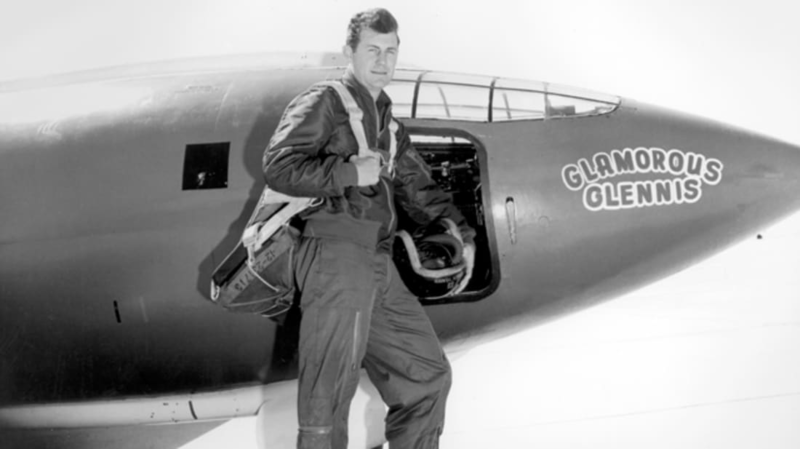 The Air Force pilot broke the sound barrier in an experimental X-1 rocket plane (nicknamed “Glamorous Glennis”) over a California dry lake at an altitude of 25,000 feet. In 2015, the nonagenarian posted a few details on Twitter surrounding the anniversary of the achievement, giving amazing insight into the history-making flight. Oct 10,1944:Ridley figured out-I should use jackscrew 2 manually change horizontal stabilizer.Next flight I try it:"Ridley, we got it made!" Oct 12, 1947: At Pancho's, Glennis challenged me 2 a horse race.Someone had closed the gate.My horse pulled 3 G's & I flew over fence-Ouch. Oct 13,1947:Told Ridley I didn't know if I could close hatch on X-1.Ridley pondered this.We were scheduled to try 2 fly MACH 1 the next day! For even more on the historic ride, check out the video below.